Green jobs make planet Earth a better place to live, and green construction and architecture can ensure that future generations won’t have to live in a post-apocalyptic Mad Max Beyond Thunderdome world. Here, you can explore sustainable architecture and how small business architects and contractors can make a positive impact on the environment and public health, all while saving money. Did you know that green building can reduce electricity consumption, landfill waste, CO2 emissions, water consumption, and save you $58 per square foot over a 20-year period? And did you know that by using recycled materials for building, energy requirements and emissions can be lowered by up to 90 percent? Or that the amount of wood and paper we throw away every year could actually heat 50,000,000 homes for 20 years? 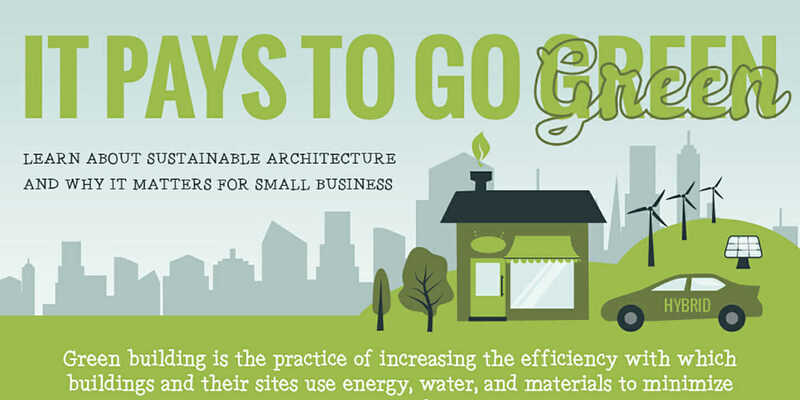 If you want to convince your boss or client to implement green building into your plans, look no further than this “It Pays to Go Green” infographic to pique their interest. Then drive the point home with more reasons why it’s good to build green. Have you worked on sustainable architecture or construction projects? Please tell us your story—good or bad—in a comment below.